For my review of Little Kids toys we received a big bundle of bubble toys. They were all so adorable and my "neice" loved playing with them. 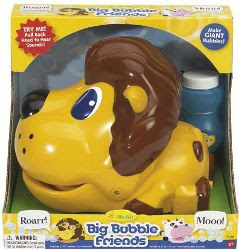 Right now, due to computer restrictions I will only be posting the review/giveaway of the Big Bubble Friends Lion, but once things go back to normal I will have the reviews of all of the other wonderful Little Kids toys, and another giveaway! Small Update really quick- Aaron's mom goes into her 2nd surgery early tomorrow morning. Doctor's said there is a 50% chance she could come out just fine and then a 50% chance that she could wake up paralyzed from the waste down.. All we can do now is wait.. I will keep you all updated.. Since we are up here in North Carolina I knew I would get a chance to meet Aaron's brother and his little baby girl Ella, so before we left I grabbed the Big Bubble Friends Lion. I thought it would be really cute to see her play with it and I also thought it would be a nice little gift for her :). After we arrived and visited, things calmed down and I got time to play with little Ella (shes only 2) at first she was really shy (it was so cute!) but once I sat down with her and pulled out the Big Bubble Lion she opened up really fast. It was so cute. It was actually her first time playing with bubbles (yay! A first with Amanda :) ) She was so fascinated by them. All you have to do is pull back the lions head and he'll instantly start blowing bubbles and "roaring" She had so much fun! I really wish I had a camera with me so you could all see her adorable face. 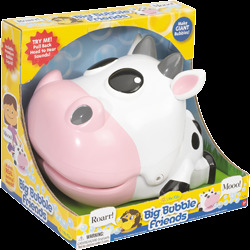 Little Kids Toys also has a Big Bubble Friends Cow that her dad is thinking about getting her. It's a great way to start introducing different animals. Mandatory entry: Visit the Little Kids Toys Website and let me know an item you would love to have. My little girl would love the Bubblun Glitter Bugs. I like the Big Bubble toys Lion. I would want the Sponge Bob bubble toys. I'm a Little Kids Inc. FB Fan~ Jennifer L.
I like the Cow and the Lion Bubble maker the best! I like the My First Bubbles Peek-a-Boo Surprise toy! Visited site and my daughter would love the BUBBLE LIGHT. I would like to have the No-Spill Mini Bubble Bucket. My 4 year old has problems with spilling the bubble solution. I like the No-Spill Bubble Blitzer Glitter Critter!